All of your How To install questions are answered in ONE PLACE! All of the current decking fastener options would certainly get the job done, however which one is your BEST option? Many people are confused which option is the best for their deck and we hope this site sheds some light. Navigate through our site and you will have a much clearer view on which fastening option is right for your particular deck. Hidden Deck Fasteners are a good choice because they leave you with a screw-free deck surface, so there is zero chance for “nail pop ups” and the beauty of the wood stand out. There are many choices when it comes to fastening options for your next deck project. If you are a professional deck builder, then you probably know about the wide variety of options that are on the market today for fastening deck boards. If you are a home owner, you might be overwhelmed by the number of fastening options there re on the market. But don’t worry, DeckWise® is here to help. Before you choose a deck fastening option please read through this site, as it will greatly increase your overall knowledge on all of your choices. Building a deck is not a weekend project, there is much thought needed to fully understand its construction. First, what type of wood will your deck be build from? Will you use pressure treated lumber for the deck surface? Many times specific areas and regions may or may not dictate what type of lumber you should use. When considering exotic hardwoods for decking surfaces, this become a little trickier. However, the end result of beautifully installed hardwood decking such as Ipe, Tiger, Cumaru or others will astonish everyone. Foundations and under structure deck joist lumber must also be given the highest attention as well. 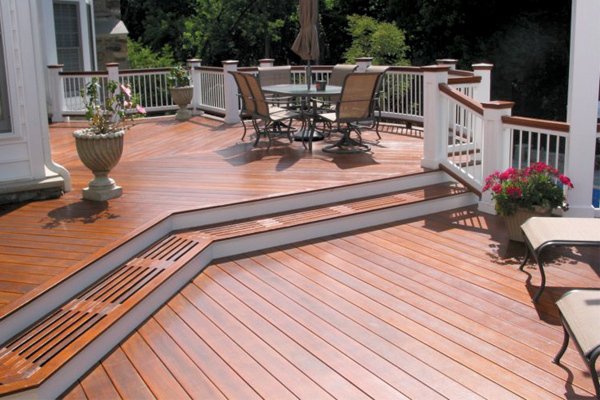 Where your deck will reside and on what type of surface can have a long lasting effect on your deck’s life span. Pressure treated woods are fine, however steel joists are becoming more popular in rainy and cold weather regions. Consideration for joist tape on pressure treated wood is also a factor. We highly suggest speaking directly with your local lumber yard to discuss all of the variables possible for choosing your decking wood. The number of deck fastener systems on the market today is extremely high, although not as many options are available as face driven screws. There are pros and cons to each of these systems as well. Each fastening or deck clip system has its own unique installation method. They all are constructed of various materials which affects their overall performance. The number one aspect to consider when building a deck is whether or not you prefer a clean smooth surface or one with face screw holes. If your preference is face screwing or toe nailing you must consider, how over time, screws and nails will slowly start to rise up out of their holes from expansion and contraction of the wood. This is called “pop up” and can destroy a deck’s integrity and lifespan. If you would rather have a smooth, unblemished decking surface we strongly suggest using our Hidden Deck Fastener system. 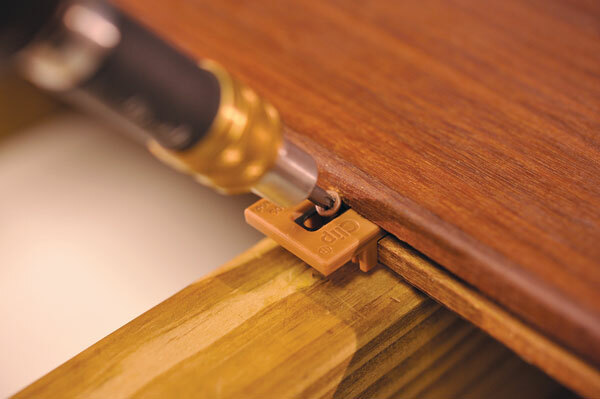 This deck fastening system utilizes small square “clips” which are reinforced with a steel insert. The fastening clips are placed in decking board gaps and screwed into the deck board and the joist below. The way these fastening clips hold the deck board down is by residing inside groves on the sides of the boards. These groves can be pre-manufactured or made with a biscuit joiner. The number of deck screws on the market today is staggering. There are pros and cons to every decking screw. Outdoor decks have to stand up to the harshest environmental conditions, so you should keep this in mind when choosing a fastening method. Deck screws come in all sorts of sizes and all sorts of applications. Whether you are building a deck with composite boards, pressure treated decking or exotic hardwoods such as Ipe, your choice of deck screw is vital. The deck screw that comes with our hidden system is a professional grade stainless steel screw. Matched with our fastener clips they are one of the strongest on the market – even up to 3 times stronger than competitors. These include three different sizes, a heat treated screw, composite screws that stop mushrooming and painted head – Colormatch Screws. Be sure to consult with your local lumber yard professional.